The Aceco FC5002 is the latest advance in nearfield FM tester with Received Signal Strength Indication. 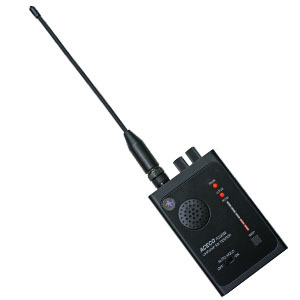 Capable of locking automatically and almost instantly onto any FM signal within VHF to UHF range. Once locked it will demodulate the FM signal and permit it to be monitored through build-in speaker or earphone. Its RSSI feature is useful in locating stuck transmitters or listening devices. There is also a feature for holding a locked channel. It can incorporate an ICOM CI-V interface for tuning with the FC3000 series. The great sensitivity to nearfild signals makes it ideal for RF security, counter-surveillance and radio communication testing applications. It comes complete with internal NiCd pack, AC wall charger, VHF/UHF flexible antenna and audio earphone. VOL Knob - This knob turns the tester on and adjusts sound volume. SQL Knob - This tunes the squelch up or down to set the signal strength for reception. SKIP Button - This frees the tester from any unwanted signals. AUTO HOLD Switch - This automatically stops and holds on an active frequency. This tester can operate for up to five hours from its fully charged NiCd batteries. They are charged when the unit is plugged into the supplied AC/DC adapter. Full recharge will occur over 12 to 16 hours. Before recharging the batteries you should be deep cycled occasionally by allowing them to completely discharge to maintain maximum battery capacity. The NiCd batteries should last for several years. However, it is a good idea to check them every twelve months for signs of corrosion or leakage. Always replace the whole set if any one cell fails. Aceco Electronics, Corp. guarantees the tester and accessories for one year against defects in manufacture. This warranty does not cover items that have been modified, subject to unauthorized repairs, misuse or abuse. This warranty does not cover damage caused by excessive power levels 15 dBm applied to the signal input.